I was in Kyoto only for two nights and three days in the summer and even though I had very limited time, I was able to visit all the important shrines and temples that are a must-see in Kyoto. Since I was traveling solo, I had hired a tour guide to take me around. The first day we saw the Tenryuji temple, the Kinkaku-ji temple, Ryoan-ji, Kenin-ji and Kiyomizu Dera, while the second day we visited the Inari shrine. I did the Yasaka Shrine myself the day I arrived. Tenryū-ji (formally Tenryū Shiseizen-ji) is the most important temple in the Arashiyama district of Kyoto. It is a UNESCO World Heritage Site. It is also knows as the 'Temple of the Heavenly Dragon'. The Tenryu-ji garden has been designed by the famous garden designer Muso Soseki in the fourteenth century and still retains the same form. The garden features a central pond surrounded by rocks, pine trees and the forested Arashiyama mountains. Muso Soseki was also Tenryuji's first head priest. It is one of the best examples of 'shakkei' in Japan which means 'borrowed scenery'. You can combine your visit to Tenryu-ji with the Arashiyama Bamboo Grove and the Okochi Sanso Villa. Read my full post on the Tenryu-ji temple and gardens. Kinkaku-ji Temple also known as the 'Temple of the Golden Pavilion' is one of the most popular attractions in Kyoto. The pond with the Golden Pavilion forms the center of the temple's garden. The garden itself is listed as a National Special Historic Site and Special Place of Scenic Beauty. Gold foil on lacquer covers the upper two levels of Kinkaku. The gold was used as a symbol of purification of negative thoughts and feelings towards death. The temple's main image is a stone statue of the Buddhist deity Fudo-myo-o. Although normally hidden from public view, the image has long been revered for miraculous powers. Open-door rituals are held in early February (Setsubun) and on August 16th. Read my full post on the Kinkaku-ji temple or the Golden Pavilion. Read my full post on Ryoan-ji Zen temple. Read my full post on the Fushimi Inari Shrine. Kiyomizu Dera is a Buddhist temple located in the eastern part of Kyoto. It is a UNESCO World Heritage Site. The temple was founded in 780 on the site of the Otowa Waterfall, and derives its name from the fall's pure waters. A wooden stage built without nails, houses the temple's primary object of worship, a small statue of the eleven faced, thousand armed Kannon. Behind the temple's main hall is Jishu Shrine, a shrine dedicated to the deity of love and matchmaking. The Otowa waterfall can be found at the base of the main hall. 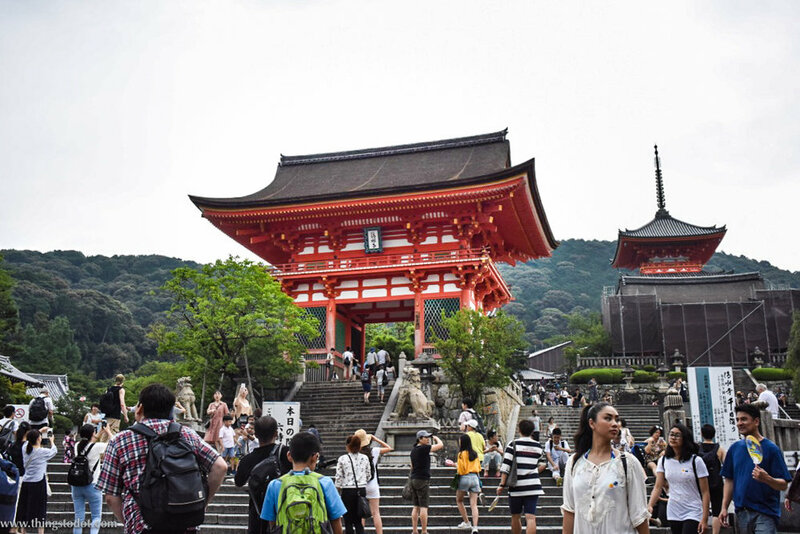 Read my full post on Kiyomizu Dera. The Yasaka Shrine, also known as the Gion Shrine, is one of the most famous shrines in Japan. It is a Shinto shrine. Shinto shrines are places of worship and the dwellings of the kami, the Shinto 'gods'. Sacred objects of worship that represent the kami are stored in the innermost chamber of the shrine where nobody can see them. People visit the shrine to pray for good fortune or to give respect to the kami. Read my full post on the Yasaka Shrine.